Start on Home Page to see the Real Penny Tile Sheets we offer. The following item is discontinued because brand new pennies are needed for its design and we noticed tiny spots of rust/oxidation on the new uncirculated pennies even as they are new in the box. Exposure to air and humidity causes this process to begin right in the box. We decided to keep the original article on this page just in case. 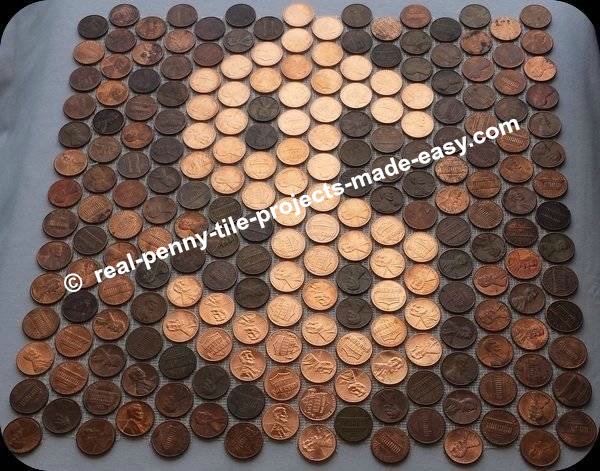 This dollar sign made with new pennies is a cool feature among our tile sheets of real random pennies. Have it installed in the spot of your choice among other sheets of pennies and it'll stand out really nice with great views. That's because the dollar sign itself is made with shiner pennies compared to the surrounding ones which are hand picked to have certain shades providing the best contrast. Here's the dollar sign ($) made with 66 shiny pennies and 158 darker random ones. 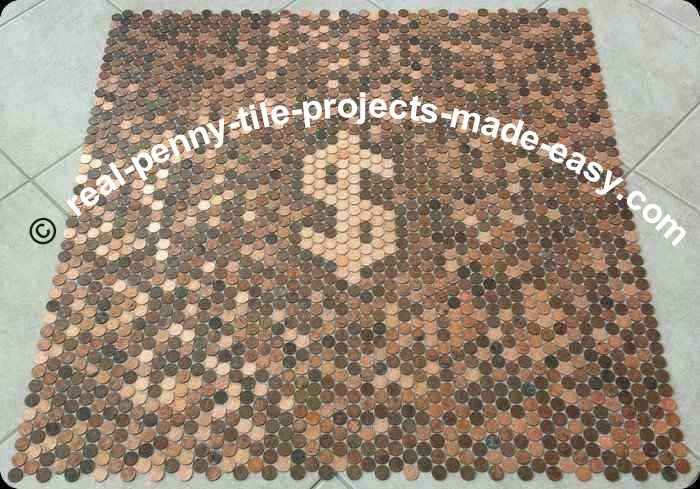 And to give you an idea how this dollar sign sheet would look interlocked with our standard sheets of pennies, we placed it on the floor and added 8 more tile sheets of pennies all around it. Remember, these are not installed (glued to the floor, grouted, etc), just laying there for the closest 'finished product' view you can get. Dollar sign sheet in the middle of 9 penny sheets. Ready to walk on money?